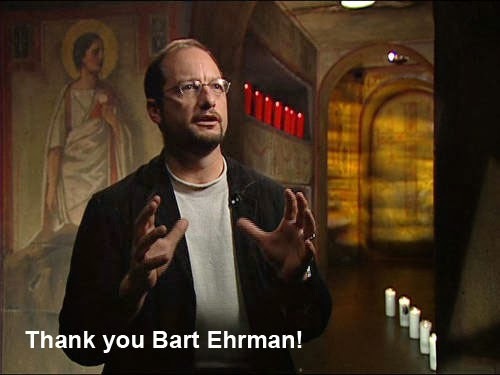 After recovering from fundamentalist religion to become an atheist, Bart Ehrman has made a career out of Jesus as an apocalyptic prophet. These two factors make it impossible for him to look at the evidence regarding the origins of Christianity clearly, which is why his most recent book was such a disappointment. Although I have read and enjoyed many of his books, I have lost much of my respect for him since "Did Jesus Exist". He is a disappointment. I'm trying to figure where you're coming from. First, from his own books, he said he became an agnostic, not an atheist, and not right away. He remained a believer even with his new views for a while. Why was his most recent book a disappointment to you? Because it didn't argue for Jesus the myth? When he argues for Jesus being an historically substantiated figure (after rejecting ultra-conservative views of him), that in my mind, gives me more respect for him. He's being intellectually honest. I still don't come to the same conclusions as he on some things, but I do respect honest scholarship.